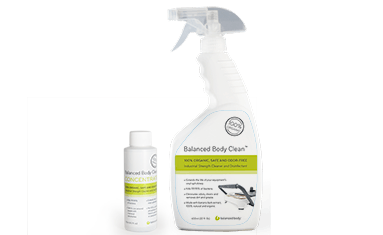 Balanced Body Clean™ is an all-purpose cleaner that is 100% natural, organic and biodegradable. It cleans, disinfects and removes dirt, grease and oil from porcelain, plastic, glass, vinyl upholstery and metal. Very useful at both work and home! Extends the life of your equipment’s vinyl upholstery. Eliminates odors, cleans and removes dirt and grease. Made with banana bark extract, 100% natural and organic. Safe for use around those with chemical sensitivities. Concentrate formula: 125 ml (4.2 ft. oz). One bottle of Concentrate equals nine bottles of the diluted mixture. Just mix as directed with water in your own 650ml to 750ml spray bottle (22 to 25 fl. oz.). You save 33% on the cost of the cleaner, plus huge savings on shipping, too! Balanced Body Clean is odor-free and made completely from a natural plant extract taken from the bark of banana trees. Does not contain VOCs, alcohols, petrochemicals, solvents, phthalates, ammonia, bleach, phosphates, dyes, preservatives or perfumes. Safe for use around those with chemical sensitivities. DIRECTIONS: Spray on, wipe off, using a clean cloth. For best results, wipe again with a clean cloth dampened with water. Do not use on cotton or leather, as it may cause discoloration on these materials. CAUTION: If sprayed into the eyes, rinse with cold water. INGREDIENTS: Musa Paradisiaca bark (banana tree bark) standardized extract and water.